Carefully sawing it open, we reserved the big yolks and whites to make a decadent chocolate mousse dessert. 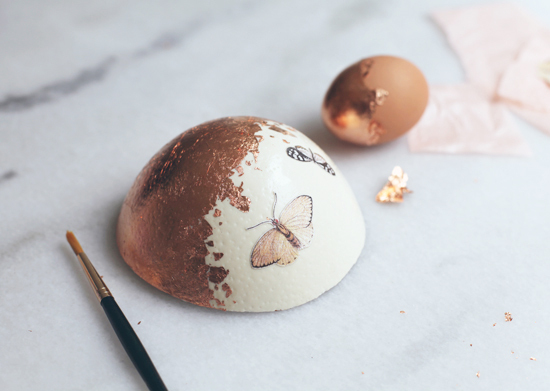 The eggshell was decorated with some of our favorite illlustrations by Maria Sibylla Merian, along with a glimmer of copper leaf on top. This dessert will wow all of your guests at your next spring gathering. With a pencil, mark around the exterior of the egg shell to indicate where to cut the lid. Place the egg over a shallow pan on it’s side and saw carefully around with a jeweler’s saw. Catch the egg white and divide from yolk into separate bowls. Reserve for making mousse and any extras are great for an egg scramble. Dry off the eggshell lid and clean off any pencil marks. Brush the leaf adhesive over areas you would like to apply the copper leaf to. Let dry until tacky and apply the copper leaf. Using mod podge, apply the photocopied images to egg shell and let dry. Prepare a water bath by filling a saucepan one third full with hot water and in a heatproof bowl, melt together the chocolate, butter, espresso powder, stirring over simmering water until smooth. Remove from heat. Set another bowl over the saucepan of simmering water and whisk egg yolks with 1//2 cup sugar, grand marnier, and water for 2-3 minutes until mixture is thick. Remove from heat and place bowl in a bowl of ice water and continue to beat until cool and thickened. Gently fold the chocolate mixture in with the egg mixture. In a large bowl, beat egg whites with salt using an electric mixer until frothy and holds peaks. Beat in the sugar until mixture becomes glossy and add in the vanilla. Fold 1/3 of the egg whites into the chocolate mixture, then continue to combine in 2 more batches. Transfer the mousse to empty ostrich egg shell and spoon any remaining mousse into small ramekins. Cover and refrigerate until firm, at least 4 hours. Can be made ahead of time and refrigerated for up to 3 days. Serve with lightly whipped cream.